Princess Charlotte was christened in a private ceremony at the Church of St. Mary Magdalene on the Sandringham estate in Norfolk. It was a real intimate family affair attended only by immediate family members and Godparents. 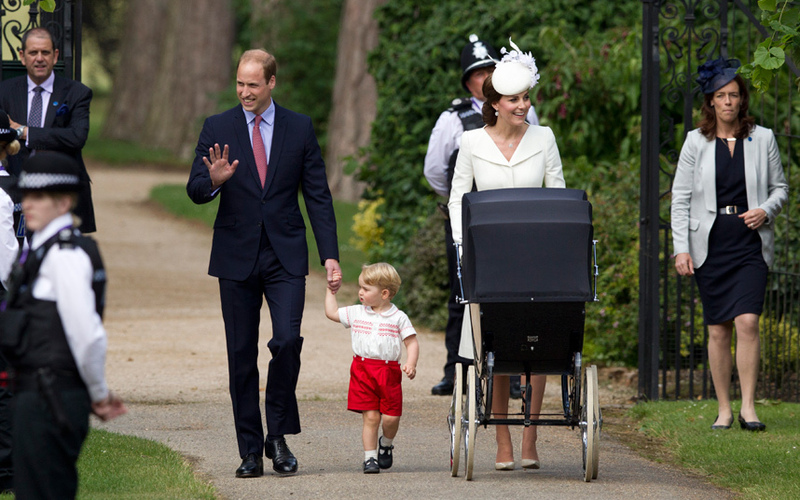 The Duke and Duchess of Cambridge chose to walk from Sandringham House to church with young Prince George at his daddy’s side and Princess Charlotte being pushed in a Millson Pram. I’m not sure how far the journey is to church, but Catherine did it in heels and looks absolutely composed and beautiful! 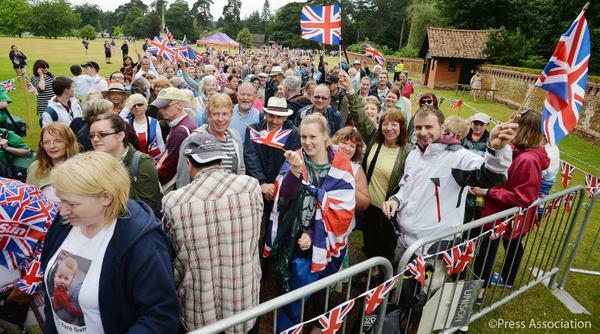 Prince William waves at the thousands of well-wishers lined up on the road. 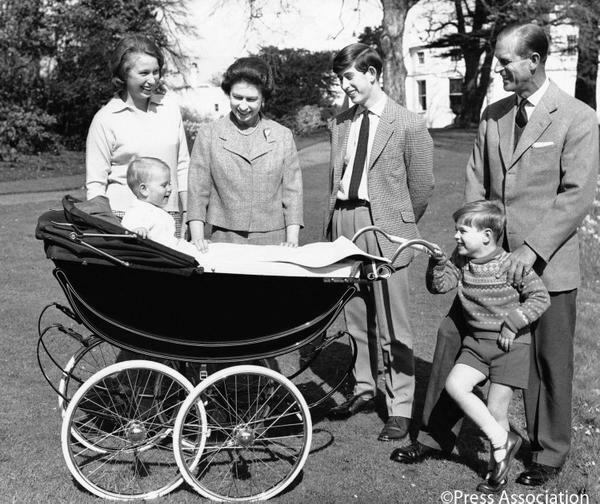 Incidentally, Princess Charlotte’s pram was also previously used for Prince Edward & Prince Andrew! It’s a Royal hand-me-down…but one I would gladly accept! 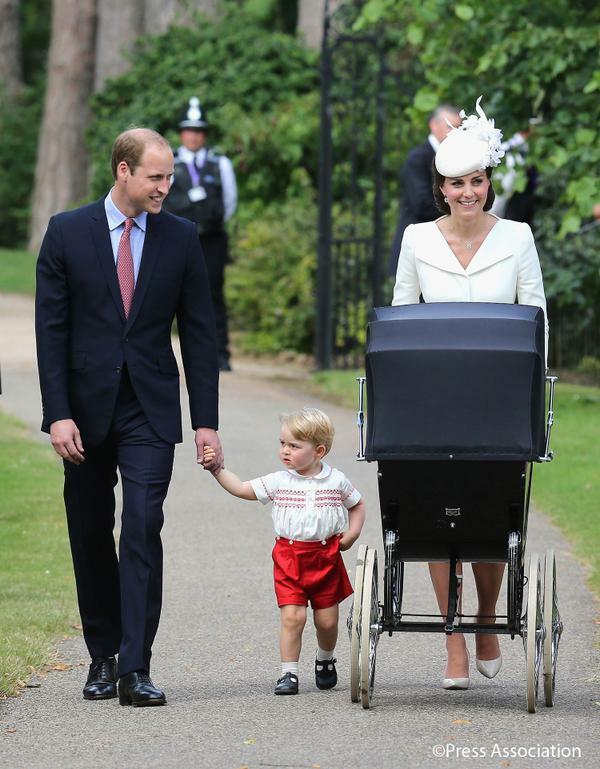 The Millson Pram…now a royal tradition. 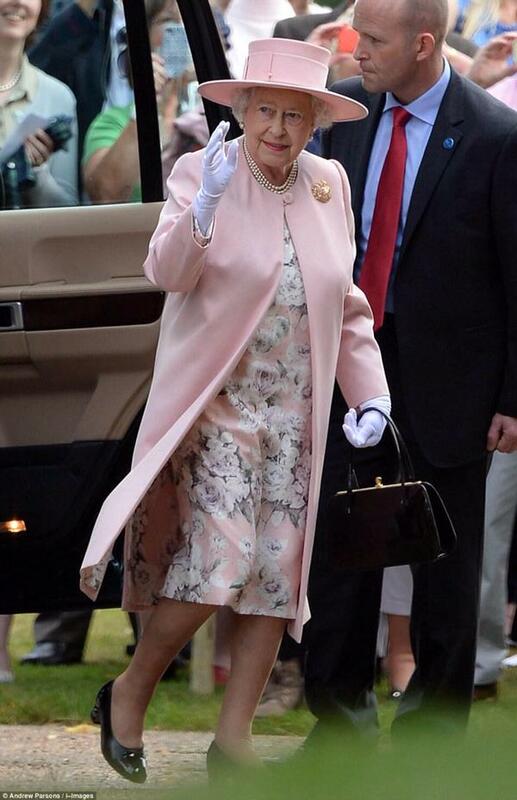 The Queen arrived looking lovely, as always, in pale pink. She’d already been to church earlier that morning. 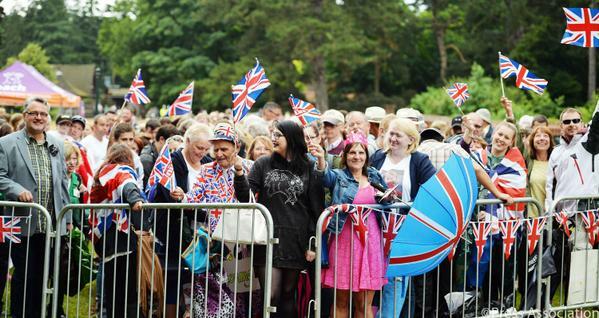 Thousands of lucky well-wishers lined the road for a glimpse of the royal family. I wonder how early they had to begin lining up? The Hon. Laura Fellowes (Niece of Princess Diana), Mr. Adam Middleton (Cousin to Catherine) and friends Miss Sophie Carter, Mr. James Meade, ), and Mr. Thomas van Straubenzee. It was thought that perhaps Princesses Beatrice and Eugenie would be amongst those chosen as Godparents, however no royal family members were given that honor. 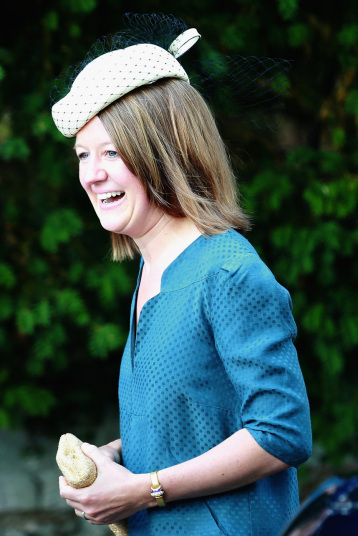 Nor were Catherine’s siblings Pippa or James. Baptizing Princess Charlotte was The Archbishop of Canterbury, the Most Reverend Justin Welby. He was supported by The Reverend Canon Jonathan Riviere, the Rector of the Sandringham group of Paris. Princess Charlotte wore the hand made replica of the Royal Christening Robe, made by Angela Kelly, Dressmaker to The Queen. 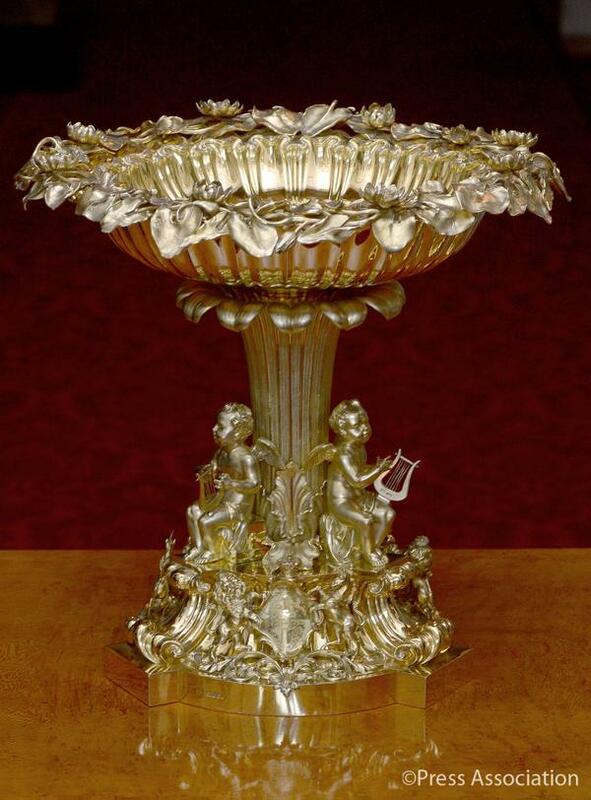 The original, now preserved, was commissioned by Queen Victoria for her daughter The Princess Royal’s christening in 1841. 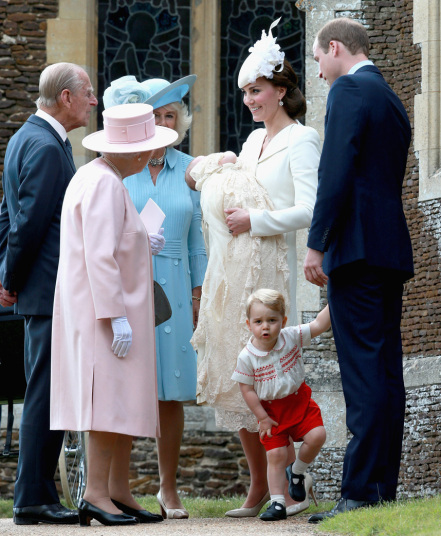 Prince George was baptized in the same Horniton lace Christening gown nearly two years ago. The Duke and Duchess of Cambridge chose two hymns, one lesson and two anthems for the christening of their daughter. The Hymns: Praise to the Lord, The Almighty and Come Down, O Love Divine. Members of The Sandringham Church Choir sang at the service. The processional organ music was R. Vaughan Williams’ Prelude on “Rhosymedre”. The recessional organ music was G. F. Handel‘s Overture and Allegro from Concerto VIII in A. 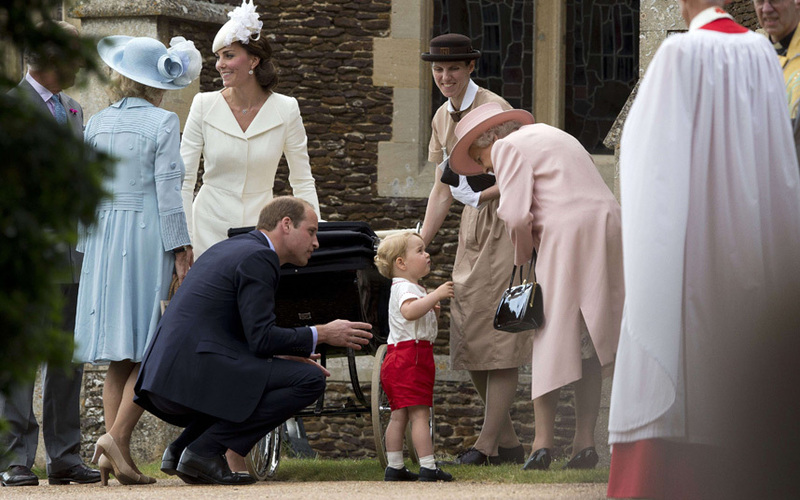 After the service, The Queen had a bit of a visit with Princess Charlotte. I love how Her Majesty looks on tenderly at her great-granddaughter. 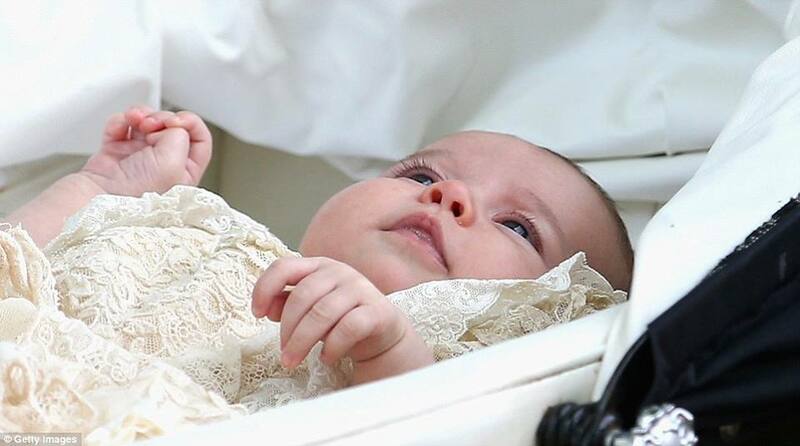 Beautiful baby, Princess Charlotte after her Christening. Is she looking up at The Queen? 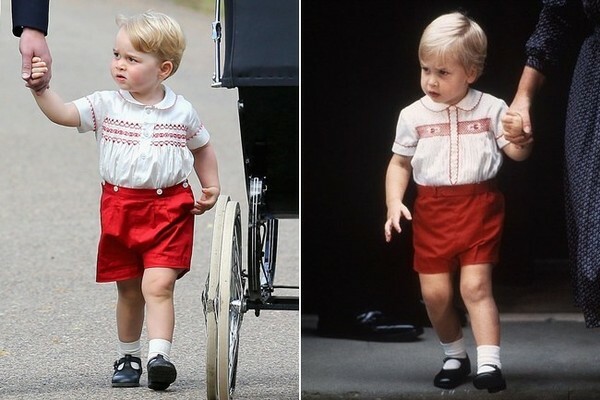 Looks like Prince George is ready to GO! Time to play! Probably my favorite photo of the day! The Queen visiting with her little great-grandson. Does he realize his great-granny is The Queen?? Granny, can I come over to your house and play? Adorable Prince George wore an outfit similar to the one his father wore when first meeting his new baby brother, Prince Harry! Can’t handle the Royal Cuteness! 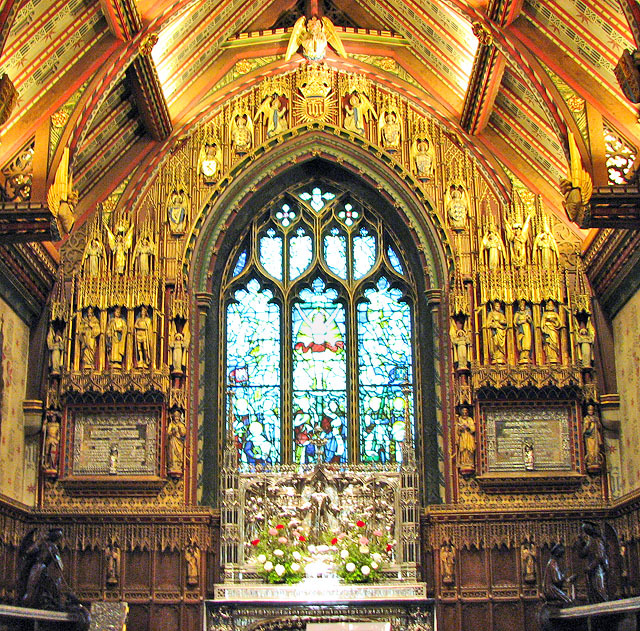 The Church of St Mary Magdalene holds sentimental significance because it is the church that Prince William’s mother, Diana Princess of Wales was baptized at in 1961. Church of St. Mary Magdalena where Princess Diana was also Christened. Peruvian photographer Mario Testino, Princess Diana’s favourite photographer, was chosen by the Duke and Duchess to take the official christening photographs. We can’t wait to see those photos! 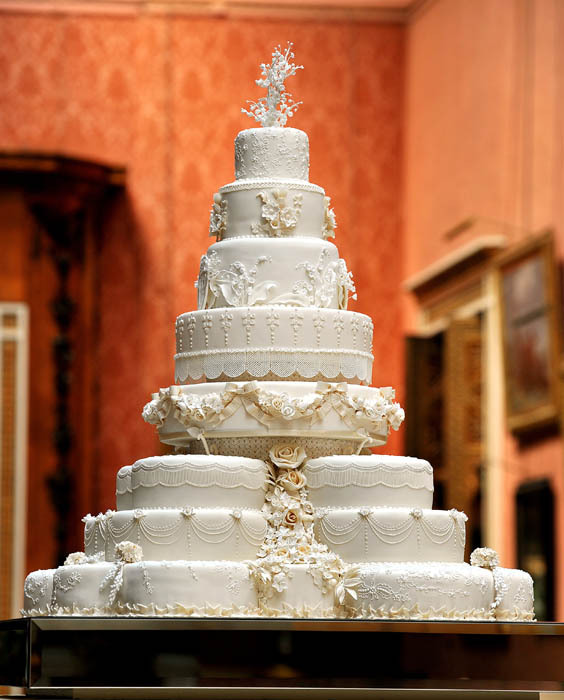 Lady Anglophile….bless the Princess Charlotte on her Christening day! This entry was posted in Rule Britannia! and tagged England, Princess Charlotte, Princess Charlotte Christening, Royal Family, The Duke and Duchess of Cambridge, The Queen, UK. Bookmark the permalink. 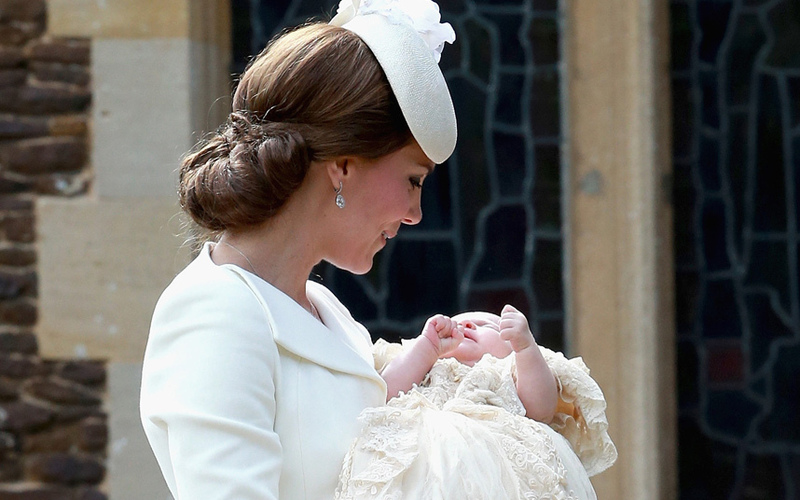 2 Responses to Princess Charlotte’s Royal Christening…A Real Family Affair! God Bless you all. My great granddaughter, Bronwynn, was born on that some day. God is good. 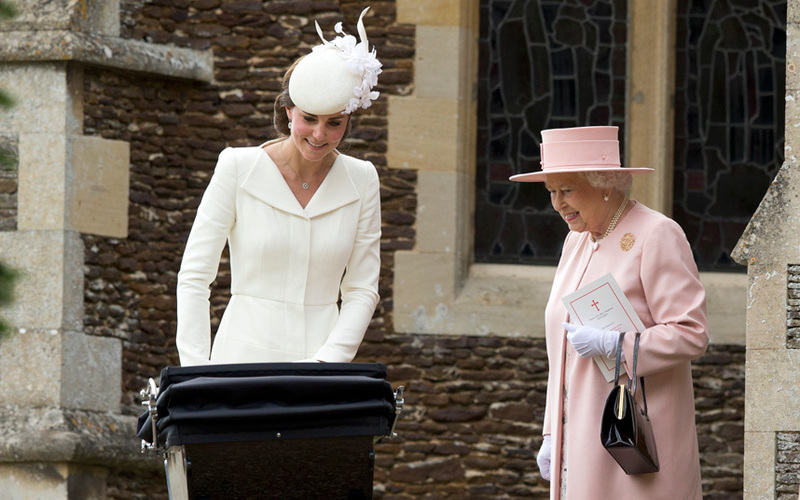 seems our Queen is smitten with Charlotte…she looked lovely. 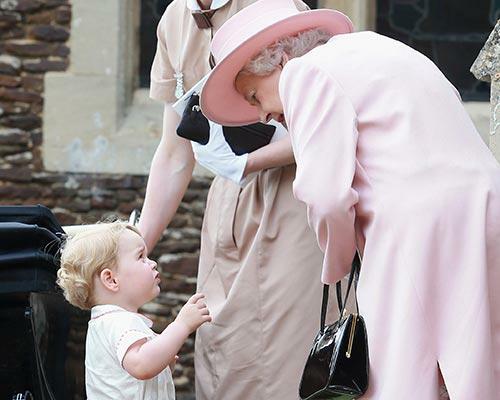 (her outfit beautiful style and a great colour Kate wore an ‘over-dressed’ style outfit for a country christening….Prince George sure wanted to play with our Queen!…..he looks at people with such awe-or perhaps he wants choose a new playmate!!! such a beautiful church too.